Dr. Katie Eklund discusses the use of universal screening scores to predict distal academic and behavioral outcomes among school-aged youth. Research has well-documented poor school-related outcomes for students with behavioral and emotional concerns, including lower academic achievement, higher rates of suspension/expulsion, increased absenteeism, and lower graduation rates (e.g., Lane, Carter, Pierson, & Glaeser, 2006). As up to 20% of school-aged children exhibit maladaptive behaviors that remain steady over time (Dowdy et al., 2013), schools are tasked with identifying and responding to student behavioral concerns in an effort to prevent these poor outcomes. Subsequently, many schools have developed multi-tiered, prevention-oriented approaches to addressing student behavioral concerns. Administering universal screening measures to identify students at-risk for behavioral and emotional concerns has been established as an important initial step in a multi-tiered model whereby student behavioral concerns are identified early to inform quick and timely intervention (Guzman et al., 2011; Walker, Cheney, Stage, & Blum, 2005). At present, the most widely used methods for identifying at-risk students is through teacher referral or office discipline referrals (Eklund & Dowdy, 2014). As students spend much of their time in school, teachers are viewed as a valuable resource in identifying at-risk students. However, sole reliance on teacher or office referrals is problematic for a number of reasons, including (a) emotional and behavioral problems are often underreported by teachers, (b) many teachers do not view behavioral concerns or reporting these problems as their responsibility, and (c) teachers differ in their ability to work with struggling students, thus referring at different rates (e.g., Severson et al., 2007; Tilly, 2008). Furthermore, office discipline referrals often overlook students with internalizing behavioral concerns (e.g., depression, anxiety) and data are not always collected reliably across school settings. 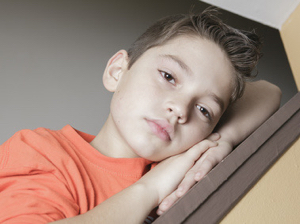 Systematic screening for emotional and behavioral problems is seen as an alternative approach to traditional reactive methods. And as schools are the most commonly accessed places where adolescents receive mental health services, school-based screening may begin to connect at-risk students with important support services. Behavioral screenings are similar to academic screening measures in that they provide useful and relatively brief performance data on an individual level. Behavior screenings focus on the identification of the early symptoms of disorders that may eventually develop into a more significant mental health diagnosis, a major life impairing condition, or the need for intensive treatment (O’Connell et al., 2009). While behavioral screenings demonstrate promising evidence of predicting important behavioral and academic outcomes, only one in eight schools engage in systematic behavior screening (Bruhn, Woods-Groves, & Huddle, 2014). Given the current state of educational accountability, wherein sizable pressure is placed on educators to ensure academic success for all students, schools are understandably hesitant to dedicate educator time and resources to activities that are unlikely to promote academic outcomes. As a result, it is necessary for researchers to develop and establish screening tools that predict not only behavioral functioning (e.g., office discipline referrals), but also academic functioning (e.g., academic skill curriculum-based measurement scores) to increase the likelihood of universal screener adoption. The current study evaluated the extent to which the Social, Academic, and Emotional Behavior Risk Screener (SAEBRS; Kilgus, Chafouleas, Riley-Tillman, & von der Embse, 2014), a novel universal screening tool, predicted various key academic and behavioral outcomes. 397 elementary students and 647 middle school students attending public schools in the southwestern United States participated in the current study. Students ranged in age from 5 years 5 months to 15 years 4 months. In the fall of 2014, each student was rated by their classroom teacher on their emotional and behavioral functioning using the SAEBRS, the predictor measure in the current study. A range of academic and behavioral outcome data were collected at the conclusion of the school year, including student’s Reading Curriculum Based Measure (CBM) scores, office disciplinary referrals, and absences. Each of these variables served as criteria in the current predictive validity analyses. Results indicated teacher ratings of student behaviors on the SAEBRS positively predicted student reading scores in the spring, aligning with prior work connecting student behavioral functioning with student academic performance (Kamphaus et al., 2010; Lane et al., 2014). Analyses also suggested that screening results were predictive of office disciplinary referral rates at the end of the school year. The current results also demonstrated significant, albeit small within group correlations with student absenteeism. This aligns with previous research demonstrating students with severe behavioral concerns are likely to be chronically absent from school (Bloom, Dey, & Freeman, 2006). Specific results suggest that subscales on the SAEBRS were highly predictive of academic and behavioral outcomes, suggesting both overall total behavioral risk and subscale indicators of social, academic, and/or emotional behavior may provide important data for school-based practitioners looking to target interventions to at-risk students. To ensure the well being of all students, universal behavior screenings provide an ideal context by which a large number of adolescents can be identified and provided services. Given the increased focus on accountability in the current educational landscape, paired with limited teacher time and school resources, it is important to select methods and measures that are efficient, psychometrically sound, and easy to use. Results from the present investigation suggest the SAEBRS-TRS may be one such universal screening measure that captures a wide range of student barriers to learning (e.g., internalizing behaviors, social relationships, externalizing behaviors), while also being highly aligned with important distal student outcomes. The SAEBRS-TRS may be used to assist school personnel in making efficient and accurate decisions by identifying at-risk students and providing evidence-based interventions. What are barriers schools might face in adoption of universal screening measures to identify students at risk of behavioral and emotional concerns? How might data obtained from screening help schools provide evidence-based interventions to at-risk students? Katie Eklund, Ph.D. is an Assistant Professor in the Educational, School, and Counseling Psychology Program at the University of Missouri, where she conducts research on school mental health including early identification and intervention for childhood behavioral and emotional concerns, school climate, school safty, and positive psychology. Dr. Eklund is a Nationally Certified School Psychologist and licensed Psychologist and currently serves as a Co-Principal Investigator on a grant from the National Institute of Justice investigating the role of School Resource Officers on school climate and student safety outcomes.